BHawaii, and Virginia) encom- passing eight dry docks and nearly 4,000 employees, is well situated to grow the majority of its business, which is fo- cused on the U.S. Navy. Most recently the company’s San Di- ego shipyard received a new 950-ft.- long, 55,000-long-ton ? oating dry dock, which is a portion of the company’s $100 million investment in the yard to service the anticipated increase of U.S.
Navy ships on the West Coast. Earlier in 2016 it was announced that are 610 ft. long, displace about 15,700 a U.S. Navy shipyard, meaning that pri- ous assault ships, auxiliary ships, cruis- the U.S. Navy had awarded BAE Sys- tons, and are comprised of steel hulls vate companies are important partners to ers, destroyers, littoral combat ships, tems a $192 million contract for work on and composite structure deckhouses. keeping USN ships on schedule and on new DDG 1000 ships The new guided Zumwalt was commissioned in Balti- transport dock and dock landing ships, and select commercial vessels) budget. 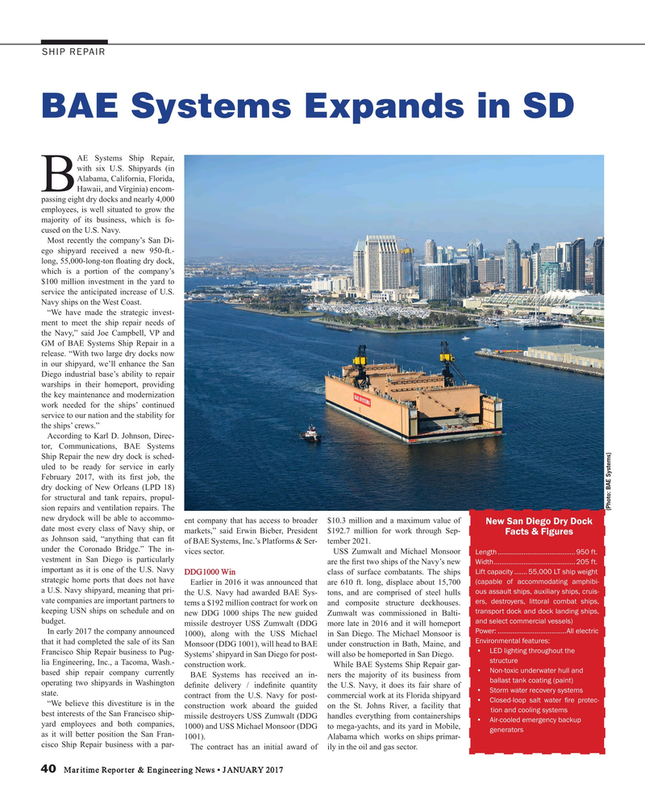 Systems’ shipyard in San Diego for post- will also be homeported in San Diego. BAE Systems has received an in- ners the majority of its business from ballast tank coating (paint) operating two shipyards in Washington de? nite delivery / inde? nite quantity the U.S. Navy, it does its fair share of • Storm water recovery systems state. The contract has an initial award of ily in the oil and gas sector.